Stylish unit blends easily with any interior. It widely applied in office building & retail environments. Thanks to the stylish appearance and slim body, the unit suits any room's decor and ambience. 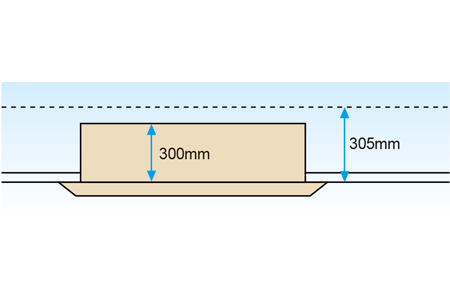 At only 300mm high, the unit requires only a small space in suspended ceilings. 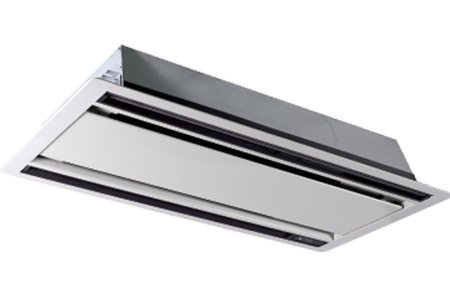 Installation has no height limitations, which means overall design features much more flexibility. 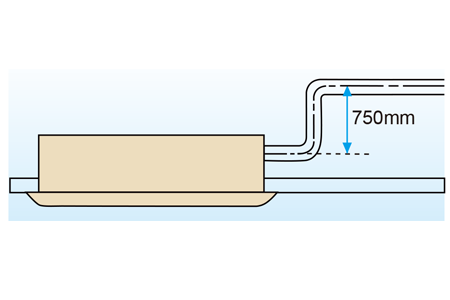 Drain pump can pump condenser water up to 750mm high, which simplifies installation of the drain piping system. 1. გაგრილების სიმძლავრის პარამეტრები: შიდა ტემპერატურა: 27℃ DB, 19℃ WB. გარე ტემპერატურა: 35℃ DB. მილების ექვივალენტური სიგრძე: 5m, დონეთა სხვაობა: 0m. 2. გათბობის სიმძლავრის პარამეტრები: შიდა ტემპერატურა: 20℃ DB, 15℃ WB, გარე ტემპერატურა: 7℃ DB. მილების ექვივალენტური სიგრძე: 5m დონეთა სხვაობა: 0m. 3. ხმაურის დონე იზომება ნახევრად ექოს არმქონე დახურულ კამერაში, აგრეგატის სტანდარტული მუშაობის რეჟიმში.